The wood sandpiper (Tringa glareola) belongs to the family of snipes and sandpipers, the Scolopacidae. 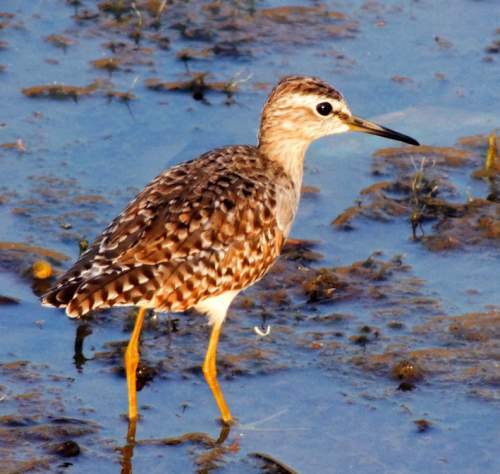 The wood sandpiper species is distributed in Europe, Asia, Africa, Indian subcontinent, southeast Asia and Australia. These sandpiper species are fully migratory. These sandpipers are monotypic species. The wood sandpiper (Tringa glareola) is a small sandpiper, measuring 20 to 23 cm in length and weighing 35 to 100 grams. The wingspan is 55 to 60 cm. The wood sandpiper has finely streaked grayish-brown head, neck and breast. There is a white supercilium. There is a brownish gray lore. The wings and the upperparts are grayish-brown with white scaly pattern. The throat and the underparts are white. The bill is long, pointed and gray in color. The irises are dark brown. There is a white eye-ring. The legs and feet are long and greenish gray in color. The call of the wood sandpiper is a soft, repeated "chick..chick" sound. These wood sandpiper species are distributed in Europe, Asia, Africa, Indian subcontinent, southeast Asia and Australia. The breeding populations of the wood sandpiper are distributed in subarctic wetlands across Europe and Asia. The wintering populations are distributed in Africa, Indian subcontinent, southeast Asia and Australia. The Important Bird and Biodiversity Areas (IBA) of the wood sandpiper species in Russia are Lapland Biosphere Reserve, Koporski Bay, Lower Ob', Forty islands and Basins of the Schuchya and Khadytayakha rivers. The IBA of the wood sandpipers in United Kingdom are Abernethy Forest, Grampian Mountains, Achanalt Marshes and Caithness and Sutherland Peatlands. The IBA in Norway is Nordre Øyeren & Sørumsneset. The IBA of the wood sandpipers in Denmark are Ålvand Klithede and Førby Sø, Borris Hede, Hanstholm Reservation and Kongens Mose and Draved Skov. The IBA of these sandpipers in Greece are Divari Pylou lagoon and Sfaktiria island. These wood sandpiper species do not normally occur in forests. They normally occur in altitudes from 0 to 1000 meters. The artificial ecosystems and habitats of these sandpiper species include irrigated fields, flooded agricultural lands, wastewater treatment facilities, water storage ponds and aquaculture ponds. 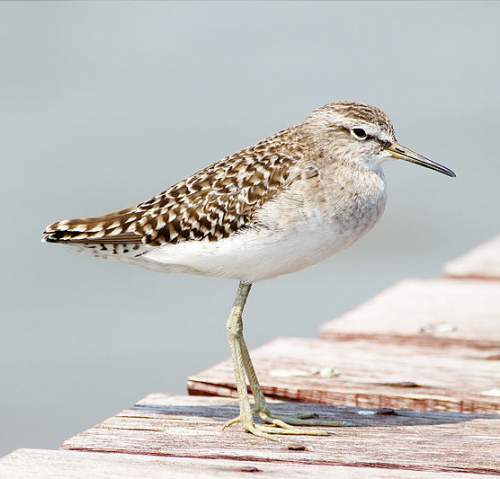 The natural ecosystems and habitats of these sandpiper species include boreal forests, tropical and subtropical flooded grasslands, subarctic shrublands, wetlands, peatlands, marshes, freshwater lakes, rivers and streams. The diet of these wood sandpiper species consists mainly of invertebrates. Aquatic insects, beetles, termites, midges, ants, insect larvae, worms, spiders, crustaceans and molluscs are their primary food. They also feed on small fish, frogs and plant matter such as seeds (del Hoyo et al. 1996). They forages visually as well as by probing in shallow water or on wet mud. The breeding season of these wood sandpiper species is during May and June in most of their breeding range. These species are monogamous and territorial. The nesting sites include open, swampy areas in boreal forests (del Hoyo et al. 1996), tundra scrublands and grassy marshes. The nest is usually a scrap in the open ground. They may also use of abandoned tree-nest of other birds. The wood sandpiper clutch contains three to four, pale green eggs. Both the parents incubate the eggs. The chicks hatch out after 21 days and become independent after about 30 days. These wood sandpiper species are fully migratory birds. The breeding populations occur in subarctic wetlands across Europe and Asia. They migrate southwards on a broad front, during June and August. The wood sandpiper arrive in the wintering grounds between August to October (Snow and Perrins 1998). The return northwards migration to the breeding grounds occurs from late-March to early-April (Snow and Perrins 1998). The sandpiper sub-adults may remain back in the wintering grounds. The global population size of the wood sandpiper (Tringa glareola) is estimated to number about 3,100,000 to 3,500,000 individual birds. The overall population trend of the species is considered to be stable. In most of its range, this sandpiper species is reported to be generally uncommon to common. The generation length is 5.2 years. Its distribution size is about 23,000,000 sq.km. Habitat alteration, fragmentation and destruction, human intrusions and disturbance, commercial hunting and capture for pet-trade are the main threats that are endangering the survival of these sandpiper species. The wood sandpiper (Tringa glareola) does not approach the thresholds for being Vulnerable, either under the range size criterion, or under the population trend criterion or under the population size criterion. The CITES (Convention on International Trade in Endangered Species of Wild Fauna and Flora) status is ‘Not Evaluated’ for the wood sandpiper (Tringa glareola). The wood sandpiper (Tringa glareola) is closely related to common redshank (Tringa totanus) and marsh sandpiper (Tringa stagnatilis). Current topic in Birds of India: Wood sandpiper - Tringa glareola.